Through our partnership with local farmer David James, Growing Futures has established Varnycrooks Organic Orchard at Threapland, We have now raised over £1,000 towards this project and planted over 80 fruit trees . 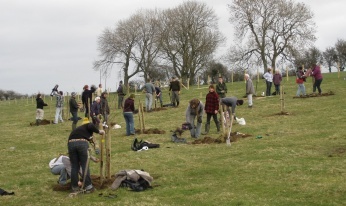 Investors make an initial investment of £25 towards the planting and maintenance of a new fruit tree. In return you have the chance to share in the future produce of this new organic community orchard. You will be repaid quite literally with the fruits of your investment, and while you may invest in one tree, you are able to reap the benefits of a diversity of fruit from the whole orchard, which will be managed to crop at different times. In addition you get the option to join in with Planting and Harvesting Events, knowing that David will be looking after your investment during the year. So you can eat Local Healthy Food knowing exactly where it came from and join in with the Events and Celebrations that will reconnect you with Local Land and Local People.